The September 11 attacks throughout the United States not only shocked the world, but dramatically influenced world history. New York City was hit the hardest as two jets crashed into the World Trade Center's North and South Towers leading to their eventual collapse hours later. In the aftermath, a number of buildings were destroyed in lower Manhattan, parts of the Pentagon were destroyed in Washington D.C., and a jet was brought down by passengers that subdued the hijackers in Pennsylvanian. Over 3,000 people were killed on this sunny September day in 2011. The Memorial, opened in the fall of 2010, provides visitors a somber place to remember and reflect on the events of this day and pay respect to the fallen. The two main features of the Memorial are the reflection pools that represent the locations of the North and South Towers. Cascading from the top is a 30 foot waterfall into a pond. Adoring the edge are the etchings of all the men, women, and children that lost their lives that day in the attacks. Other unique features of the Memorial include a museum, numerous planted white oaks, and the "Survivor Tree," a pear tree that was growing at Ground Zero that survived the attacks. Surrounding the Memorial are the new World Trade Center buildings. The most notable is World Trade Center 1, now the tallest building in the United States, as well as the construction of 5 more trade center buildings. Located Downtown at 33 Liberty St., the NY Federal Reserve bank is at the heart of the Financial District and is one of the most fortified buildings in the world. It is one of twelve regional Reserve Banks created by Congress in 1913 in an effort to decentralize banking and control. Overseen by the Board of Governors in Washington, regional Reserve Banks aim to "promote effectively the goals of maximum employment, stable prices, and moderate long-term interest rates" by enacting monetary policy. 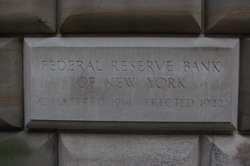 The New York Regional Bank has its own unique responsibilities, most notably for storing monetary gold for foreign central banks. The gold vaults are held eight floors below ground and at any point in time, holds between 360-400 billion dollars in a half million bars of gold. Each bar of gold is worth roughly $700,000. Battery Park located on the southern edge of downtown Manhattan, was found by Dutch settlers in 1623 and settlement began on what was called “New Amsterdam” in 1695 by the Dutch West India Company. In 1626 this area became Fort Amsterdam and thus got its name by the series of gun batteries that were placed around the shore in 1683. Castle Clinton, one of the only remaining fortresses in Manhattan was originally on a human-made island right off shore built in anticipation of the War of 1812, but land filling expanded the borders and the fortress became part of the mainland, which is used today as a place to sell tickets for the Statue of Liberty/Ellis Island ferry. Two centuries after settlers arrived it became the 1st immigrant receiving station in America, which saw about 8.5 million immigrants before being replaced by Ellis Island. Today the 23 acre park is called the city’s “front lawn” and is popular tourist destination to pick up ferries, to see the fortress, and to see all the memorials and monuments honoring soldiers, explorers, inventors and immigrants. Little Italy is the neighborhood where Italian immigrants settled in the 1880s after their previous settlements in the Five Points neighborhood was demolished as an early urban renewal project. Some consider the area to be the birthplace of the Mafia in the United States. Little Italy’s most famous mob hit occurred at Umberto’s Clam House at 129 Mulberry Street where mobster Joey Gallo was killed. As the saying goes, “he ordered clams but he got slugs.” Today, Little Italy is home to many restaurants dotting the landscape around Mulberry Street, the first of which opened on Spring Street in 1905 as New York’s first pizzeria. The Feast of San Gennaro Festival takes over these streets during the last two weeks in September when Italians celebrate the Patron Saint of Naples. The festival consists of parades, music, and a world famous cannoli eating contest. Small gathering of Occupy protesters. Created in 1968 by United States Steel and now controlled by Brookfield Properties, the centrally located park is a POPS-privately-owned-public-space. This unique public-private relationship has been used as grounds for suppressing the Occupy Wall Street movement. Since 2011, Zuccotti has been a staging ground for Occupy protests but protesters have been kicked out for ‘inspection and cleaning’, including when we visited in March 2012. Currently, the Occupy presence in Zuccotti is rather small in numbers but loud in voice. What is truly astounding are the sheer numbers of NYPD surrounding the park at all times, monitoring the protesters actions. Besides the police and protestors, the park is a popular hangout for tourists and financial district workers to relax and eat food from nearby food trucks. Chinatown Manhattan is home to the largest enclave of Chinese people in the Western Hemisphere. An enclave is a territory whose boundary lies entirely in another territory. According to the 2011 census 650,000 Chinese inhabited New York City. There are two major eras’ that have ultimately contributed to the formation of modern day Chinatown. The Chinese Exclusion Period describes the mass movement of Chinese immigrants from the West coast to the East. Discrimination and laws preventing Chinese immigrants from obtaining employment was the focal pushing factor during this period. Around 1870, the first wave of approximately 200 Chinese immigrants journeyed to the east coast in search of a better life. The number of immigrants grew to around 2,000 in 1882 and climbed to 7000 by the 1900. Chinese “Tongs” or gangs dominated business, economics and politics in Manhattans early Chinatown. The Immigration and Nationality Act of 1965 facilitated the mass immigration of Asian immigrants into the United States. This large influx of immigrants resulted in a population explosion in Chinatown ultimately expanding the boundaries to the North and West. Chinatown’s proximity to the financial district of New York City has gentrified some areas resulting in high property values. The high living standard is posing threats to newer poor immigrants looking for a place to live and work. As a result, smaller enclaves have emerged in more financially manageable neighborhoods in Brooklyn. Presently, Chinatowns economy consists of jewelers, banks, authentic restaurants, tours, electronics, and the garment industry. The September 11th attacks caused a major decline in the local economy. Major streets closed causing restaurants and shops to go out of business. Only recently has the local economy started to recover. The ethnic immigration patterns of Chinese immigrants have also varied over time. Pre 1960, immigrants primarily arrived from the Guangdong province and Hong Kong region and spoke primarily Cantonese. Post 1960’s, Chinese immigrants began arriving more from the Fujian Province and spoke Foochow and Mandarin. Interestingly, there was a greater number of illegal immigrants during this second wave of Fuzhou immigration. The western side of Manhattans Chinatown harbors the Cantonese populations were the eastern side caters more to the Fuzhou. The Cantonese, who have a longer establishment in the enclave, are involved in more tourism in Chinatown and also own more businesses. The Fuzhou populations were unable to assimilate right away to the Cantonese language barriers resulting in large populations migrating to Brooklyn’s evolving Fuzhou Chinatown. Historically the Fuzhou were involved in more crime. Found in the Essex Market in the Lower East Side, Shopsins has developed a cult-like following due in part to the eccentric attitude of its owner, Kenny Shopsin. Kenny’s antics drew international attention at the Sundance Film Festival for the movie I Like Killing Flies. He states “My approach to running a restaurant is the exact opposite of ‘the customer is always right.” The rules at his restaurant include only parties of one to four, everyone must order something different, no take out, not too many questions, no substitutions, no attitudes, eat and get out if there is a line, and absolutely no cellphones. If rules are violated, you will be asked to leave the restaurant. 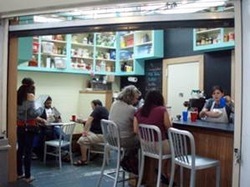 It is estimated that two to three customers are asked to leave each week. The menu is comprised of unique combinations of American food, like pancakes (called Slutty Cakes) including pumpkin, peanut butter, pistachios, and cinnamon (called the Original) or skillets called Blisters on my Sister combining eggs, duck fried rice, crisp pancake, and cheddar cheese (called the Chinese). Shopsins is certainly a unique dining experience. One of the most notable symbols of our country’s history is that of the Statue of Liberty. One might consider this to be quite odd, as the statue was actually built by the French, and was given to the United States as a gift celebrating the success of our nations’ creation of a successful democracy, as well as a show of friendship between the two nations. It now stands as a testament to the freedom of the American people, as well as a symbol of hope for those seeking to live the American dream of life, liberty, and the pursuit of happiness. The statue itself was designed and made in France under the oversight of sculptor Frederic-Auguste Bartholdi. It was then designed by Eugene-Emmanuel Viollet-le-Duc and a more household name Alexandre-Gustave Eiffel. It is made entirely of hammered copper rods bent around a steel frame. The chemical process of Oxidization over the years has caused the statue to change from its original chrome copper color to the green tint that it is today. The statue itself (not including the giant stone pedestal on which it stands) stands 151’1” and weighs an astonishing 225 tons! It was erected and dedicated on October 28, 1886 in a ceremony headed by President Grover Cleveland. It was originally slated to be erected in conjunction with the 100 year anniversary of the United States, but due to budget constraints was not put up until the aforementioned date. Chances are that if an immigrant was arriving in the United States to the United States, and coming from a country on the other side of the Atlantic, they arrived in the United States via Ellis Island. It was Americas’ largest and most well-traveled immigration facility, which at its peak saw 5000 immigrants travel through its doors per day. 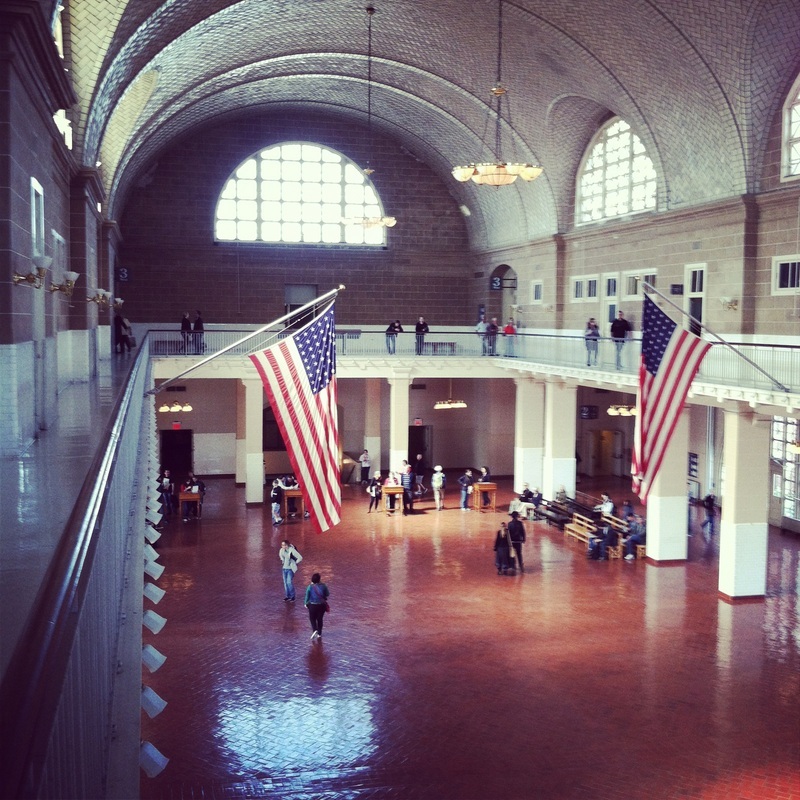 Ellis Island, while most popular for being an immigration station, was originally intended to be something completely different. Ellis Island was originally established in 1808, as a battery to be used as coastal defense for New York City. It wasn’t until 1892 that Ellis Island opened up its doors as an immigration depot, but it very quickly became the hub for immigration into the United States. Between the years of 1900-1910 the United States had an influx of nearly 9 million immigrants, about two-thirds of which were funneled through Ellis Island. European immigration decreased in the mid 1900’s and the land use on the island subsequently changed yet again. In both WWI and WWII the island served as a station for housing aliens from enemy countries. In WWI the island was home to a large number of German detainees, while during WWII Japanese, German, and Italian aliens found themselves confined to the island. The depot closed permanently in 1954, and the island is now part of the national parks service. It now functions as a museum and a memorial to all those who entered our great country via the port of New York City.